Diary LR110 CSW Writes: Incompetence! Incompetence! Incompetence! We Land Rovers have to put up with some dodgy owners sometimes, but this takes the biscuit! We are driving along on some admittedly poor dirt roads after crossing the border from Kenya to Uganda at the Suam river on the northern slopes of Mount Elgon when it starts to pour down. Now, what would someone with half a brain cell do in such conditions? He would stop, reduce the tyre pressures and engage low ratio and even more importantly his brain. Oh, no not for my owner….here we are flying over black cotton soil (Makes the slimiest mud in the world) and he is having a conversation!!! I ask you! So, he loses it, puts me nose down into a raging torrent of a gulley and compounds the mistake by trying his usual trick of reversing back out of the problem. Theory being that if you got in forwards successfully you will be able to get out the same way. Anyway, again, no reduction of tyre pressures and no low ratio and it may have even helped to put the difflock on at this point. So I end up cross axled across a deep gully with one front and one back wheel buried up to the top of the wheel rim in thick gooey mud. Clare summed up my feelings exactly when she said “Don’t you think it would have been better to look and think before you reversed?” I think she was quite lucky to get away with that comment at that time!! Anyway, out he gets and gets his grandads’ shovel off the back and starts digging….of course there is nothing to connect the winch to and the rain is pouring down whilst thick red mud is now halfway up his legs and he is sinking rapidly. At this point the rain stops and what seems like hundreds of happy laughing school children turn up to see what the crazy Mzungu are up to…(Mzungu is a Swahili word for white person and is also used to describe a hang over) At this point a black man stuck his head in the passenger window and said “Hello, Mamma, welcome to real Africa. 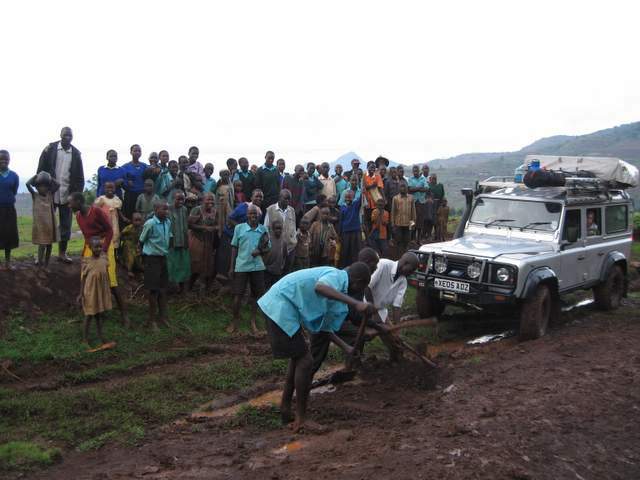 These are real African roads and this is real African mud and all these people are real African people” Anyway to cut a long story short, with Simon the “real” African organising the hundreds of people we were soon out and back on the road, but by this stage the kids and Clare were so terrified of the muddy roads and vertical drops that we voted by 5 votes to 2 (Ashley and I voted to continue) to camp by the side of the road as it was dark by this stage. I have since found out that Clare rigged the vote by promising the kids two bars of chocolate each!! Ashley spent the night worried about every noise and person who walked past and kept his “dog stick” next to him. A Ugandan army patrol stopped and said “you will not be attacked here…” which proved to be true and the next day we completed the remaining 40kms along the rapidly drying road to the Sipi falls. Pic shows: AFTER GETTING UNSTUCK, WE STILL HAD TO GET BACK ON THE ROAD.